When you say you work on indoor skydiving, both people will think it’s a bit easier; and whilst that’s true in the respect that you spend less time in airplanes, other than that it’s still challenging. You have to work in a building not designed for broadcasting, with space restrictions meaning it’s a lot harder to get full quality cameras into the wind tunnel, and you have to integrate with a complex scoring system. That’s just to name just a few challenges. As any sports broadcaster will tell you, the key to any show is the action. It’s all about what’s happening right now. What’s the story? In indoor skydiving, as in any sport, a big part of the story is the score. It’s what dictates the intensity of each round, the speed of the competition, and tells you how far or how tantalisingly close a team is to that coveted first-place spot. But the challenge for us as broadcasters is that, for several reasons, the scores are not released live, and they aren’t released first on the broadcast either; meaning we have to expect the viewers of our program to already know the scores, making it even more challenging to create an intriguing show. To create a broadcast that grabs our audience, we use two key components. Firstly, atmosphere, the feel of the competition. Using a wireless camera, we travel around the venue with 1 or 2 presenters to see competitors practicing (‘dirt diving’ or ‘creeping’). We refer to this as ‘Roaming’, and it offers us the opportunity to demonstrate the event is more than just a competition, it’s a social occasion. Secondly, a variety of content. In skydiving, everyone knows everyone, you don’t just support your ‘local’ team. As such, the coverage we produce has to be varied and feature as many teams and people as possible. To achieve this, we use a mixture of segments: Formal seated interviews in a studio environment; our ‘roaming’ sections; live commentary on the tunnel footage as well as reviews of judged rounds to give technical analysis for the geeks of the sport. We also have a live tunnel camera, which is useful, but rarely plays a significant role in the production You can’t have any sounds (have you ever tried pointing a microphone at 180mph wind?) and it doesn’t provide any context due to the lack of scores. As the production manager, it’s important the technical set up we put in place allows the producers to fill the stream with as many varied and interesting sections as possible. 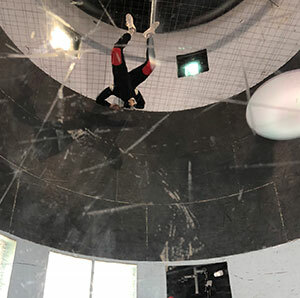 Indoor skydiving facilities are large buildings, and don’t just have the tunnel, they also feature ‘creeping’ areas’, where competitors practice their formations on what are essentially skateboards that you lay on. All these facilities also have a social area of some sort, whether it be a temporary marquee, a bar area or a restaurant. It’s important to cover these spaces as they are a big part of the atmosphere for any competition. The final key space is the entrance to the tunnel, or the ‘anti-chamber’ as it’s called, which is a key area to see as it shows the build up to each jump taking place. With the ability to put presenters in all these spaces, and have them interact with competitors, spectators and judges, the producers have a wide arsenal of live content to choose from to fill the show. The final part of any stream is pre-produced content. We bring a content producer along to every stream we do; it’s someone to film and edit videos, highlight reels, comedy sketches and so on, meaning two sets of content can be created at once, the stream and the videos, so there is backup content if the scoring is falling behind, and rounds for the next team to be interviewed haven’t been released yet. This content serves two very important purpose, firstly to provide the audience with a bit of relief from constant live content, and secondly, to provide the broadcast crew a bit of relief from constant live content too! One of the technical challenges of producing a sports broadcast which is so segmented (10 rounds with potentially hundreds of teams) is that if the presenters want to recall a round for them to analyse live, it’s not that speedy to scroll through so many videos, let alone having to import them into the playback system. This is where we look at integrating with the scoring system, which has to host all the videos of the judged rounds anyway. The scoring system which most competitions use has a little-known feature that allows for quick playback of round VTs. Once the presenter has called a round to be analysed, all we need to do is input the class that team compete in, the team number and the round, and we can have that video playing back in a matter of seconds, rather than the up to 30 it could take to locate that teams number and scroll through potentially thousands of videos to find the one they want. This sorting by team-number idea is what we also use to allow us to do run-and-gun style graphics recall. If we’re live from the social section of the event (usually a bar) with the roaming camera, the presenters can (and do) jump into any conversation and as most competitors will have either their team name or team number on the front of their jump-suit, by the time the presenter has finished saying ‘Let’s jump in and have a chat withâ€¦’ you have that graphic ready for when they introduce themselves. Ultimately, that is the core of the reason we are hired. If we make the competition appear big and exciting, more competitors will turn up the following year, leading to an even more exciting broadcast; and this repeats on a yearly basis. These are just some of the techniques we’ve used and developed over roughly 5 years of working on the broadcast of skydiving, and hopefully we’ll develop even more over the next 5.